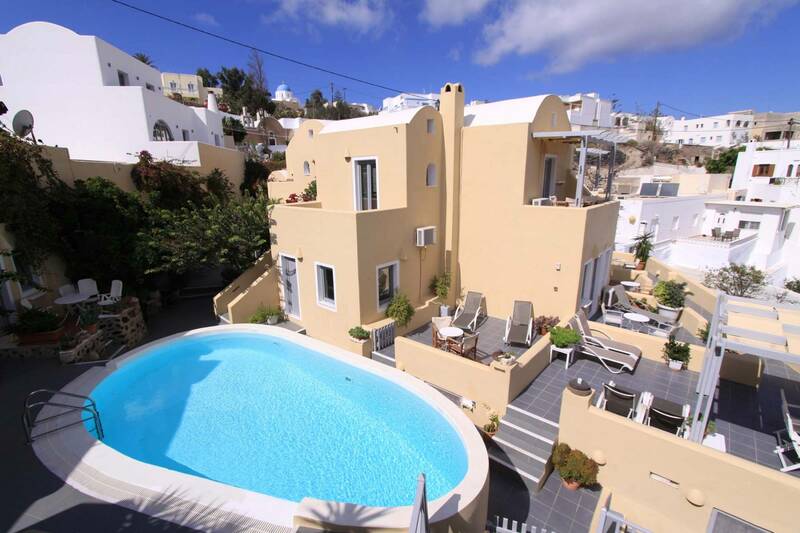 In beautiful Cyclades, in enchanting Santorini, the island of dreams and love, and in Firostefani area, one finds Ersi Villas, a Santorini hotel with modern facilities for pleasurable vacations. Ersi Villas offers quaint accommodation on the island of Santorini Greece, one of the Cyclades unique Mediterranean destinations. The villas, conjoined in a cluster, feature traditional influences within a calm atmosphere. Ersi Villas charming guestrooms in B&B use rustic decor while the outdoor pool area allows for relaxation amid the close-knit municipalities of Santorini. 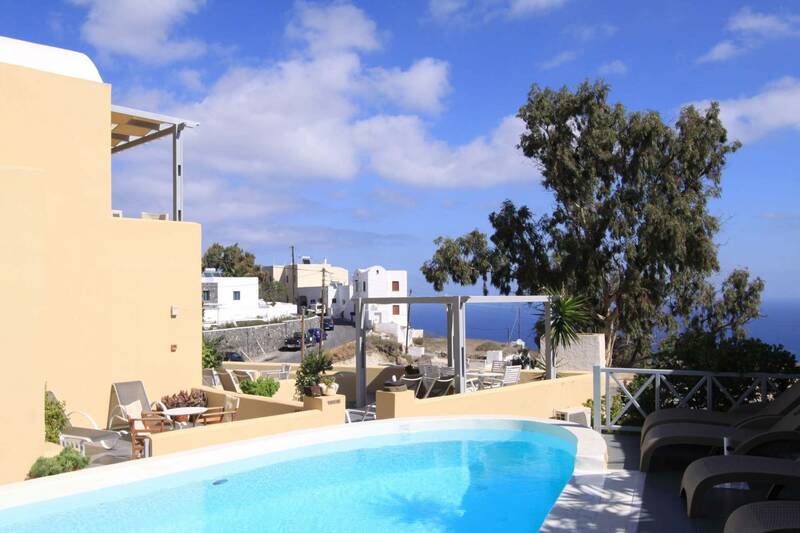 Villa Ersi is situated in the charming Firostefani area, 500 meters from the main square of Fira, the picturesque capital of the island. Our location offers a view over the Aegean Sea and the Eastern coastline of the island, quick access to the city shopping area and island's nightlife. The location of our Santorini Bed & Breakfast, away from the hustle and bustle of Fira town, in combination with the peaceful environment of our accommodations, guarantees a relaxing holiday. Ersi Villas is a Family run Hotel with a personal touch, a place where you will experience the island hospitality. Our family will provide you with advices, information and recommendations to visit Santorini island at its best. Our family environment combined with the privacy and cleanness, is sure to make your holidays the most enjoyable yet. Tourists wanting to have a marvelous beach holiday in Greece will simply fall in love with this island in the Aegean Sea. In Santorini you will find accommodation in traditional-style rooms as unique as the island of Santorini. All rooms feature all modern comforts and amenities, in order to satisfy the needs of the most demanding guests looking for Santorini Studios, making their holiday a memorable one. An excellent choice for those wishing to explore the wonderful island of Santorini. Check out our Best Available Rates & Offers in Santorini Greece, book online or send us a request!